Preface. Introduction. Early Literature and Problems in Terminology. Sources Used. Scope of the Book. Framework of the Book. General Characteristics of Glacigenic Sedimentation. Depositional Processes in the Glacigenic Environments. Characteristics of Glacigenic Sedimentation. 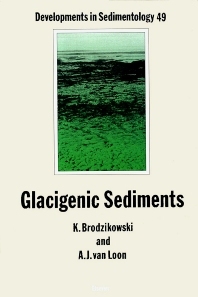 The Influence of Climate on Glacigenic Sedimentation. The Influence of Endogenic Factors. The Sedimentary Facies. Facies Interpretation. Glacigenic Facies Models. Terminology and Usage of Symbols. The System of Glacigenic Depositional Environments. The Glacigenic Environments as an Energetic Entity. Depositional Sedimentary Environments and their General Model. Glacigenic Facies and Their Characteristics. The Melting-Ice Facies. The Glaciofluvial Facies. The Marine Bottom-Current Facies. The Glaciodeltaic Facies. The Glaciolacustrine Facies. The Aeolian Facies. The Mass-Transport Facies. Tables of the Continental and Marine Glacigenic Environments, Subenvironments, Facies and Deposits. The Continental Supraglacial Subenvironment and its Deposits. Supraglacial Conditions on Active Ice. Supraglacial Conditions on Passive Ice. Geological Processes in the Supraglacial Subenvironment. Deposits of the Supraglacial Melting-Ice Facies. Deposits of the Supraglacial Fluvial Facies. Deposits of the Supraglacial Deltaic Facies. Deposits of the Supraglacial Lacustrine Facies. Deposits of the Supraglacial Aeolian Facies. Deposits of the Supraglacial Mass-Transport Facies. The Continental Englacial Subenvironment and its Deposits. Englacial Conditions in Active Ice. Englacial Conditions in Passive Ice. Sedimentation Processes in the Englacial Subenvironment. Deposits of the Englacial Melting-Ice Facies. Deposits of the Englacial Fluvial Facies. Deposits of the Englacial Mass-Transport Facies. The Continental Subglacial Subenvironment and its Deposits. Subglacial Conditions under Active Ice. Subglacial Conditions under Passive Ice. Sedimentation Processes in the Subglacial Subenvironment. Deposits of the Subglacial Melting-Ice Facies. Deposits of the Subglacial Fluvial Facies. Deposits of the Subglacial Deltaic Facies. Deposits of the Subglacial Lacustrine Facies. Deposits of the Subglacial Mass-Transport Facies. The Marine Glacial Environment and its Deposits. Sedimentary Processes in the Marine Glacial Environment. Deposits of the Marine Glacial Melting-Ice Facies. Deposits of the Marine Glacial Bottom-Current Facies. Deposits of the Marine Glacial Mass-Transport Facies. The Continental Terminoglacial Subenvironment and its Deposits. Sedimentation Processes in the Terminoglacial Subenvironment. Deposits of the Terminoglacial Melting-Ice Facies. Deposits of the Terminoglacial Fluvial Facies. Deposits of the Terminoglacial Deltaic Facies. Deposits of the Terminoglacial Lacustrine Gacies. Deposits of the Terminoglacial Aeolian Facies. Deposits of the Terminoglacial Mass-Transport Facies. The Continental Proglacial Subenvironment and its Deposits. Sedimentation Processes in the Proglacial Subenvironment. Deposits of the Proglacial Fluvial Facies. Deposits of the Proglacial Deltaic Facies. Deposits of the Proglacial Lacustrine Facies. Deposits of the Proglacial Aeolian Facies. Deposits of the Proglacial Mass-Transport Facies. The Continental Extraglacial Subenvironment and its Deposits. Sedimentation Processes in the Extraglacial Subenvironment Deposits of the Extraglacial Aeolian Facies. Deposits of the Extraglacial Mass-Transport Facies.Sedimentation Processes in the Marine Terminoglacial Subenvironment. Deposits of the Marine Terminoglacial Melting-Ice Facies. Deposits of the Marine Terminoglacial Bottom-Current Facies. Deposits of the Marine Terminoglacial Deltaic Facies Deposits from the Marine Terminoglacial Mass-Transport Facies. The Marine Proglacial Subenvironment. The Marine Extraglacial Subenvironment and its Deposits. Sedimentation Processes in the Marine Extraglacial Subenvironment. Deposits of the Marine Extraglacial Bottom-Current Facies. Deposits of the Marine Extraglacial Delatic Facies. Deposits of the Marine Extraglacial Mass-Transport Facies. Epilogue. References. Subject Index. The book will be helpful in describing the sediments involved, interpreting their genesis, establishing their extent and their mutual relationships, and thus in the reconstruction of the palaeogeographic development. The large list of references reflects the author's extensive search of the literature.